What is State of Wonder About? This work transports you to the forefront of scientific advancement among the beauty and danger of the Amazon. Pharmaceutical research scientist, Dr. Marina Singh, is sent to investigate the progress of a groundbreaking drug after her friend and colleague, Anders Eckman died attempting the same inquiry. This mission includes tracking down her former mentor, Dr. Annick Swenson, an uncompromising woman who is leading the research and running things exactly as she sees fit. Dr. Swenson was part of a dark event of Dr Singh’s past that had Marina turning away from a career in Obstetrics. Rachel: I really loved the fresh feeling this narritaive had. Not only was it a book featuring women and reproduction as central themes, but the main character is a scientist who also happens to be a middle-aged, unmarried, woman of color. And then, that women gets to go on an adventure to the Amazon?! Sign me up. I also appreciated all the deep character development in the novel. They all felt like fully fleshed out people, and I think science fiction, which this book is, can sometimes neglect when the science is so central to the plot. Meridith: This book was a captivating read and it was enjoyable following these women through their travels and experiences as this story unfolded. This is a great book to read with a friend. I immediately called Rachel once I finished and was so glad to have someone to talk it over with. I appreciate that this book is concerned with the motivation behind the scientist’s actions and decisions even at the expense of the characters likability. These women are deep and complex and are both faced with difficult goals and making sacrifices for their work. Rachel: I think Meridith and I agreed that the book was a slow starter. For myself, I don’t mind a slow start when it means the characters are being developed. However, so much happens in the last third of the novel, and some of it did feel a bit rushed. I honestly would have preferred a longer novel that didn’t feel so crammed in the end, but I know “make it longer” isn’t something authors are generally told by publishers. Meridith: I am always on team “make it longer”, so I agree with Rachel. You really need to sit and digest the last bit for a long time, but that’s not necessarily a fault. This book is probably best for young adults and up. Lots of different science fields are intertwined in this work and while you don’t need a deep knowledge of any of them you might benefit from a cursory background understanding. This novel is perfect for escaping into a wholly different side of science while also addressing many of the moral implications of drug development. If you enjoyed this Science Book Club review, be sure to check out our other posts: OTHER POSTS. Just as we love to received recommended books, we also love to pass them on to others! We’ll be giving away our copy of State of Wonder to one lucky reader (US only, sorry). 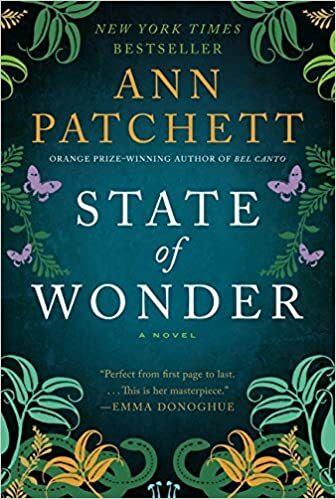 Posted on April 17, 2019 April 17, 2019 by Sweet Tea, SciencePosted in book club, Reading, science and the media, the power of words, travelTagged ann patchett, book giveaway, giveaway, reading list, recommended reading, Science Book Club, travel. I won the last book club book (Gerald Durrell’s My Family and Other Animals) way back when, and now thanks to a kindle ebook credit, I’m reading the second in his trilogy, Birds, Beasts and Relatives. This one is just as full of wonderfully told, I-can’t-believe-that-really-happened stories and natural history discoveries! The best STEM book I’ve read recently is “Feather Thief” which might also interest a true crime crowd, or a crowd of “this story has so many twists it’s impossible to believe it’s non-fiction”. My favorite STEM book ever is “Demon in the Freezer” (these are both non-fiction, I realize). I haven’t read much STEM-related fiction, but it would be awesome to start!